Smollett get away with Hate Crime – DBL standard? Smollett’s spokesperson made it look like he is innocent or there is no evidence on him, well at least no counting the check, the brothers from Africa and more. The TRUTH is the FBI is working on it, It WILL become a federal case! 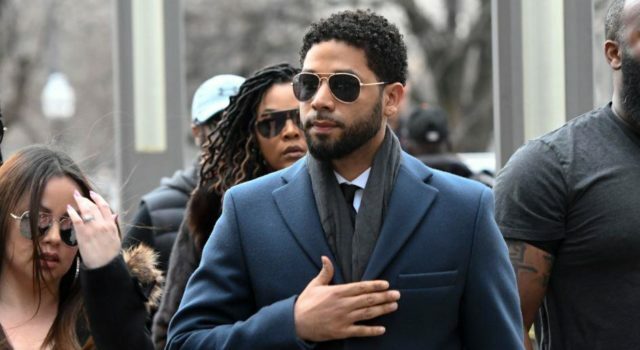 However, Smollett was brought in for an emergency court session in which the judge ruled the case against him would be dropped. Doubt was cast on the open-and-shut nature of the case when Fraternal Order of Police President Kevin Graham wrote the Justice Department following reports that Cook County State’s Attorney Kim Foxx asked Police Superintendent Eddie Johnson to let the FBI investigate Smollett’s allegations that he was attacked by two masked men after the former chief of staff to former first lady Michelle Obama allegedly informed Foxx that Smollett’s family had concerns about the probe. According to local reports, Johnson was blindsided by Tuesday’s events and is expected to address the situation later in the day. A rep for Fox, which produces and airs “Empire,” said the studio and network had no immediate comment. A spokeswoman for Cook County prosecutors didn’t immediately respond to messages requesting comment. Previous articleShifty Schiff turning on Mueller? Next articleBig Media CON – Big Flop!